New York City, N.Y., Aug 2, 2018 / 03:18 am (CNA/EWTN News).- Today’s feast of Our Lady of the Angels of Porziuncola and its associated indulgence is a way to focus on the importance of Mary and the Franciscan tradition in the Church, said one friar. 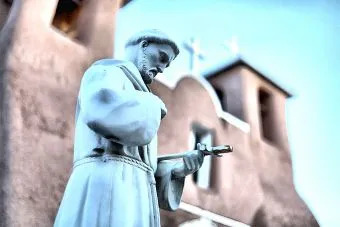 “The Porziuncola is at the heart of the Franciscan journey,” Father David Convertino, the development director for the Holy Name Province of the Observant Franciscans, told CNA. The Catholic Church teaches that after a sin is forgiven, an unhealthy attachment to created things still remains. Indulgences remove that unhealthy attachment, purifying the soul so that it is more fit to enter heaven. Indulgences are either plenary (full) or partial. A plenary indulgence also requires that the individual be in the state of grace and have complete detachment from sin. The person must also sacramentally confess their sins and receive Communion up to about 20 days before or after the indulgenced act. Anyone who visits a Catholic church with the intention of honoring Our Lady of the Angels and recites the Creed, the Our Father, and prays for the Pope’s intentions, may receive a plenary indulgence on Aug. 2. “Any kind of a prayer form that helps people come closer to God is obviously a good prayer form, and certainly an indulgence is one way,” Fr. Convertino said. The Porziuncola was built in honor of Our Lady of the Angels in the fourth century, and by St. Francis’ time had fallen into disrepair. The church, which was then located just outside of Assisi, became the “motherhouse” of the Franciscan orders. “Although Francis realized that the kingdom of heaven is found in every dwelling on earth … he had learned nevertheless that the church of Saint Mary at Portiuncula was filled with more abundant grace and visited more frequently by heavenly spirits,” says the life of St. Francis written by Friar Thomas of Celano, read today by Franciscans. The Porziuncola, a rather small chapel, is now located inside a large basilica which was built around it, to enclose and protect it. For Fr. Convertino, the duality of the big church and the little church is a reflection of the relationship between the world-wide Catholic Church and the smaller communities which make it up. Fr. Convertino also discussed the fresco now painted around the entrance of the Porziuncola, which shows St. Francis, together with some of his followers, receiving the indulgence from Christ and Our Lady. This article was originally published Aug. 2, 2013. Los Angeles, Calif., Jun 7, 2017 / 11:33 am (CNA/EWTN News).- The Archbishop of Los Angeles has urged a prayerful and prudent response to a housing crisis in his city, relating the problem to the link between human and environmental ecology.